When local architects John Kuhn and Chris Riddle began their first project together in 1978, they never imagined it would lead to a thriving partnership. In fact, they had no idea where it would take them. But success, they’ve learned, is a lot like architecture — you start off with a foundation and steadily build your way upward. Kuhn and Riddle made a risky decision back in 1978, quitting their jobs after receiving a $500 commission to complete a sketch for the Northampton Armory. Kuhn admits it wasn’t one of their most calculated moves, but looking back on it almost 40 years later, he realizes their decision built the foundation for what would eventually become Kuhn Riddle Architects (KRA), one of the most successful firms in the area. Fast-forward 36 years — past the initial years of uncertainty, past the fire that engulfed one of KRA’s early buildings, past the painstaking process of building not only structures but relationships — and the firm is prospering in a challenging climate. With 16 employees, it isn’t the largest or smallest firm around, which Kuhn believes is conducive for success in projects of varying scales. Kuhn estimates that the firm completes between 50 and 100 projects a year, many of them involving major renovation and reuse efforts. This year, KRA designed renovations for the building that formerly housed the First Baptist Church of Amherst — which now serves as non-academic offices for Amherst College — in addition to renovating an Easthampton mill into affordable housing units and redesigning a Springfield building for National Public Radio. With dozens of old, once-bustling buildings now sitting dark and abandoned, New England towns are perfect for renovation projects that save structures and money. Like many area architectural firms, KRA has mastered the ability to modernize and repurpose old buildings that would otherwise remain blights on their communities and eventually be torn down. For this issue and its focus on architecture, BusinessWest goes behind the scenes at KRA to see how it takes concepts off the drawing board, or the computer screen, as the case may be, and makes them reality. The building in which Kuhn and his staff work each day is also a testament to the power of redevelopment. 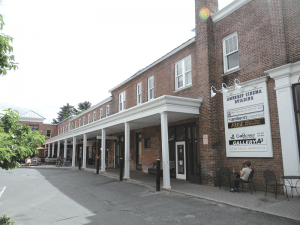 The Amherst Cinema Building at 28 Amity St., which houses the KRA offices, Amherst Cinema, Arise Pub and Pizzeria, GoBerry Frozen Yogurt, and HB Financial, among other businesses, has become a major recreational and commercial hub in downtown Amherst. But it wasn’t always that way — many residents recall the building’s former distress before KRA completely overhauled it in 2006. 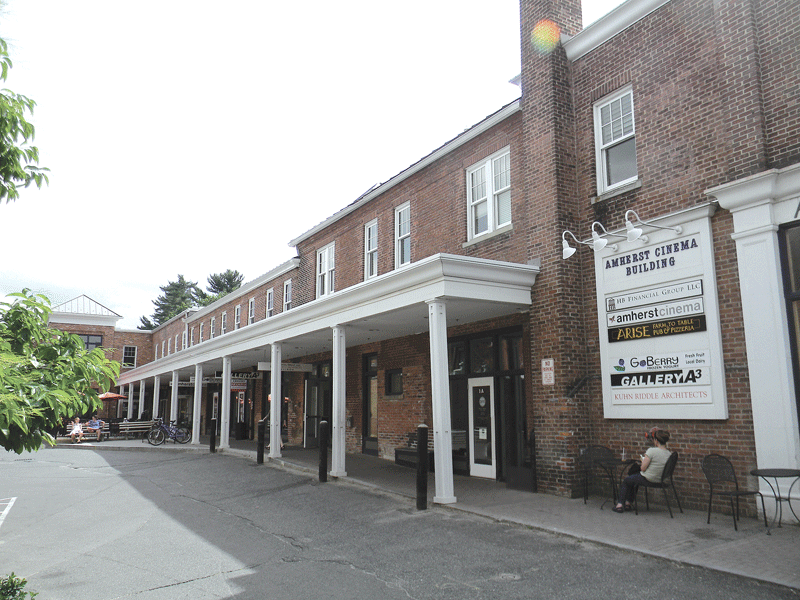 The renovated Amherst Cinema Building is now one of the highlights of downtown Amherst and home to KRA’s offices. For local business and civic leaders, the project was not only a restoration, but a reclamation. 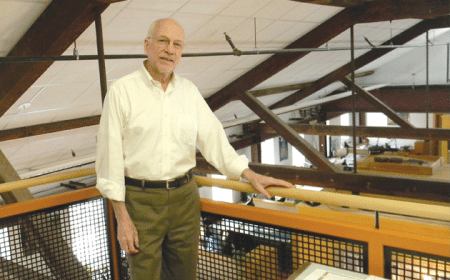 Don Courtemanche, executive director of the Amherst Area Chamber of Commerce, described the work Kuhn and his staff put into the building as a major revitalization effort for the town and region. The project also emphasized Kuhn’s belief in the importance of strengthening cities and towns at their cores by renovating and redeveloping in downtown sections, as opposed to taking on multiple projects calling for new construction at the fringes of towns that offer few geographical benefits. ‘If it’s old and broken, fix it up’ would be a fitting summary of KRA’s stance on redevelopment — and at 28 Amity St., arguably the new heart of downtown Amherst, the benefits and opportunities are endless, even after normal business hours. “The building doesn’t go dark at five o’clock like a lot of downtown buildings. With the cinema and the shops, it’s alive even on weeknights and weekends,” Courtemanche added. Yet another advantage for Kuhn to renovating the building that would house his firm’s offices was the ability to include details to enable his employees to maximize their production each day. With spacious rooms and high ceilings comprised of the original beams and trusses, the building has a historical yet modern air, far removed from the standard office environment. 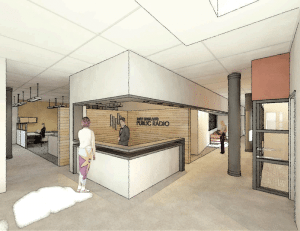 “It was a great opportunity for us to design our office and create new workspace,” Kuhn said. A successful career can often distance business leaders from their early adversities, but Kuhn still remembers the struggles he and Riddle endured, the ones they had to persist through in order to build their firm into its current incarnation. Their first few projects were completed out of a cramped, rented space in 1978. “That’s how we got started,” said Kuhn, “in someone else’s office” — until they partnered with Bill Gillen and began to establish an identity in the community. In November 1989, a fire totaled their office and forced the staff to move to another building. On several occasions thereafter, business threatened to dry up, but through it all Kuhn and Riddle stuck together and used their struggles as learning tools. 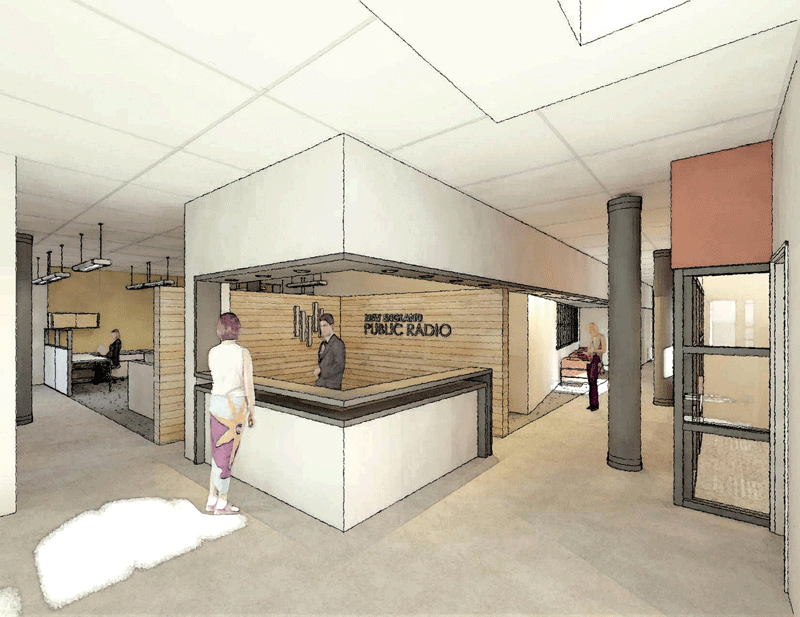 This rendering shows an interior view of the renovated Fuller Block in downtown Springfield, which will house National Public Radio. One of the most important lessons Kuhn and Riddle learned during their challenging years was the value of building lasting relationships. Recently, KRA has completed several projects for Yankee Candle, a relationship that has strengthened with each new endeavor. Local high schools and universities are also a wellspring for annual construction opportunities, as they are constantly expanding and evolving to better serve their student populations. It’s always difficult to predict the future when it comes to the construction industry, but Kuhn anticipates housing will dominate KRA’s focus over the next five years. In a bustling college town like Amherst where apartment units don’t go vacant for very long, student housing is always a hot topic, but it’s become even more of a focal point in an economy that has seen student costs soar. There will also be an increased need, Kuhn believes, for affordable-housing opportunities for families living in and around Amherst. Following the recent completion of a successful affordable-housing project in what has been a busy 2014 for KRA, the firm is eagerly anticipating the opening of 43 units at Olympia Oaks in town. The conversion of abandoned mills, warehouses, churches, and other defunct buildings into affordable-housing units and senior-living facilities has become a popular construction approach over the past 10 years, one that KRA and other firms have taken advantage of with their expertise in adaptive reuse. No matter how big or small the project, Kuhn and his staff are ready to tackle it, not simply with the goal of renovating or constructing buildings, but continuing to transform promising real estate into vital assets for area communities. In a nutshell, this is what the company has built on that foundation that Kuhn and Riddle laid all those years ago — and continue to build today.